One devastating thing to think about is violence in schools. Many people get used to their children going to school and making it home safely every day, but it is important not to take these days for granted. Instead, it is important to address the issue of school violence and learn as much as possible about how to prevent violence in schools. Many people do not realize just how much taking certain steps and working proactively to prevent and crack down on school violence can make a difference in how safe children, as well as school officials and faculty, are in a school setting. This doesn’t just apply to those at the high school level, either; parents of children from kindergarten all the way up to grade 12 should take school violence very seriously; this can help prevent school shootings and other tragedies from occurring. Although it is important to think about and work to prevent school shootings, not all school violence is on this massive of a scale; this doesn’t mean that it isn’t important, however. For instance, bullying occurs in American schools at all different grade levels on a daily basis, and it can lead to violence in the long run. Even what seems like harmless teasing could soon escalate into something much more serious, so all types of school violence, regardless of how serious or seemingly minor, should be taken very seriously by both those who work in schools and those who send their children to school every day. Many schools have started utilizing metal detectors as a form of keeping weapons out of the school, and this is a measure that all school administrators should consider taking in order to keep their school systems safe. Although some people do not like the idea of using metal detectors in schools, doing so can help keep everyone safe. There are several types of metal detectors that can be used in order to keep knives, guns and other deadly weapons off of school campuses. For instance, school administrators can consider installing metal detectors on each of the entrances to the school; this will mean that every child — or adult — who enters the school will be scanned for weapons and other metal objects. Although this can be a bit of an irritation for someone who is wearing a metal belt or something else that is equally as innocent, it can also be a great way of keeping everyone safe. Handheld metal detectors can also be utilized in order to keep schools safe. Although this does require additional manpower in order for it to be effective, the additional cost of hiring someone to use a metal detector at the entrances and exits of schools will be well worth it if lives are saved. Metal detectors certainly aren’t the only types of equipment that should be used in order to protect school campuses and the children and faculty who use them on a daily basis. In fact, there are a lot of different measures and types of equipment that can be used in order to keep schools much safer from the threat of violence. • Locked doors with limited access. Keeping entrances and exits to the school closed and locked at all times is a great way to monitor who enters and exits the school and to keep everyone who is inside the school safe from danger. • Make sure that sufficient staff is on the campus at all times. With budget cuts affecting many school systems, many administrators cannot fathom hiring more people to work in their schools. This can be harmful, however; a school that does not have enough staff members cannot possibly have enough control over what goes on in and around the school during the day. Along with increasing awareness, educating children and maintaining security equipment and good security measures in order to protect schools, it is also very important for parents and faculty members to watch out for dangerous behavior. Violence should always be taken very seriously in a school setting. What seems harmless could escalate into something much more serious, and even minor fights can lead up to much more serious attacks. Therefore, school officials and parents alike should make certain that they take all acts of violence seriously. 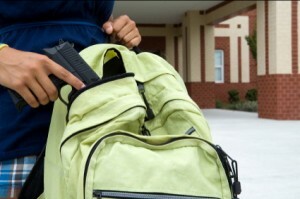 Contact us today if you would like more information on keeping your school safe.